Now we come to the fourth and final quadrant, the one that all companies should strive to be in: the outcome focus quadrant. In the outcome focus quadrant, people concentrate on areas that are important to their success, managers support them through coaching, and measurements and reward systems are aligned to support the focused use of time. The net result, as you would expect, is to produce outcomes that benefit the organization and directly improve the desired returns. It all sounds so easy, but if it were, every company would be operating smoothly and efficiently. Unfortunately, getting to the outcome focus quadrant is actually quite a challenge. In part, the challenge stems from the changing nature of work in organizations. In simpler times, work was essentially explicit and task based. What was important was evident. Whether the work being produced was to standard was easily evaluated. Alignment, focus, and attention to the tasks that mattered were practically self-evident. The nature of work today, however, is mostly abstract. Though some explicit and valuable tasks still exist, the majority of work consists of mental activities such as analysis, planning, and synthesis. The best performers most likely have developed effective mental models that guide their use of time to focus on producing outcomes that add value to the roles they play—and ultimately to the success of the organization. In earlier times, teaching explicit tasks was important to developing the organization. Today, understanding and teaching successful mental models is the key to individual and organizational success. For example, on a recent project involving a complex sales role, we learned a simple territory planning strategy from the top performers that was a critical element to their top-tier performance. They had discovered what mattered, incorporated those elements as a part of their mental model, and were devoting a significant percentage of their time to focusing on those elements. Unfortunately, leadership was mostly unaware of the importance of these particular focus areas, and there was significant tension between what management wanted and what top performers knew mattered. To the managers’ credit, when they were made aware of the critical nature of the top performers’ mental model, they immediately began to coach other performers to spend more focused time and energy on the elements that comprised the top performers’ mental model. That began a virtuous cycle where management coached performers to focus on things that matter, performers began to produce those outcomes more consistently, and the organization benefited from improved sales results. What does management in your organization focus on? How do they ensure attention is properly placed on outcomes that matter? This week we’ll look at the third quadrant: the missed opportunity quadrant. In many ways, the missed opportunity quadrant can be the most frustrating of all. Being in this quadrant is a result of identifying areas that matter but being unable to focus appropriately on those areas. It’s like seeing the finish line, but for some reason not being able to reach it. Too often missed opportunities stem from our success. Allow us to explain. How many times have you heard (or said), “If you want something done, give it to the busiest person”? Or, perhaps, “We need to put our best people on this effort”? While we have all successfully deployed these strategies from time to time, the basis of this concept relies on top talent. All good organizations rely on recruiting and deploying talented people. The trap, when this is the principal approach, is that as the organization grows, finding and bringing on new talent at the levels required to sustain the growth is extremely difficult. And because systematic development to grow talent within the organization has been ignored, those who have proven themselves tend to be called on repeatedly. As a result they become stretched too thin, and in an effort to juggle all the we-need-you-on-this requests, even the most important requests fail to receive the attention they need and deserve. Whether this phenomenon exists at micro or macro levels within the organization, it produces missed opportunities. Five plus or minus two is a rule from neuroscience that suggests that we as individuals can truly focus on only three to seven items of importance. Our study of top performers confirms that optimum performance comes from focusing on four to seven discrete outcomes. More than that and attention is divided between too many worthy endeavors to complete any of them with excellence. Next week we’ll discuss what happens when we first determine what matters and then appropriately focus our attention on those things: the outcome focus quadrant. Are you and your best people spread too thin on too many we-really-need-you-on-this endeavors? This week we’ll move on to the second quadrant, which is also not desirable: the activity focus quadrant. Activity focus is the byproduct of good attention but attention on activities that contribute little value to a role or the organization. In the distracted quadrant, we learned that people bounce from one shiny object to the next, never really accomplishing anything. As we discussed last week, that is usually the result of a management team’s chasing the latest and greatest miracle cure. Organizations end up in the activity focus quadrant when too little time is spent up-front to determine what will produce value. Instead the managers pick a few easy tasks to focus their time and attention on, often convincing themselves that sheer action will produce positive results. What’s frustrating about this quadrant is that success at the task level does not bring success at the role or organizational levels. At the risk of offending some organizations, we’ll offer one such example: measuring average call time in a call center. Average call time, or ACT, is an easy and tempting measurement for call centers. The premise is simple: calls cost money; therefore, it’s good to handle customer calls quickly. If calls can be dealt with in less time, then more calls can be handled by fewer representatives at a lower cost. All good, right? If short calls are good, then really short calls are even better. So call center representatives are given incentives to make their calls as short as possible. All of a sudden, representatives are curt, calls are mysteriously dropped or transferred, customer requests are short-circuited, and customer satisfaction decreases. The ACT is low, but so too are sales and customer retention. So management focuses its attention on and measures something that is easily assessed but doesn’t deliver real value. Performers follow the management’s lead and deliver exactly what is expected: short, ineffective calls that not only fail to retain customers but also all too often push customers away. Performers turn their scarce attention to areas of performance that are unlikely to produce real value. They produce what they are asked for, but those goals don’t really matter. 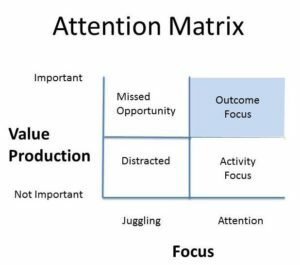 Next week we’ll look at what happens when we first figure out what matters, but then don’t properly focus our attention on those things: the missed opportunity quadrant. Are you focusing on and measuring activities that are easy but carry no evidence of being linked to performance? 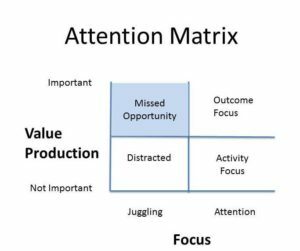 Let’s start with the least desirable quadrant in our attention matrix: the distracted quadrant. Distraction comes from attempting to juggle too many things that carry little or no value for the organization or individual. This quadrant would seem to be the least of our concerns. It’s obviously worthy of so little attention that both individuals and organizations should be able to easily avoid it. Unfortunately, that’s not the case. All too often, we find ourselves wondering how so many people get caught in the trap of distraction. Let’s start with the choice of what to focus on: the value-production axis. Tasks of little importance also tend to be items of little risk. They spring up as the next bright, shiny object. They are easy to attain, project great promise, and tend to be easy to measure. They are, however, shallow and often provide misleading information. At the risk of offending some organizations, allow us to paint a word picture using some all-too-common brush strokes: the management flavor of the month. We’ve all heard about it before, usually laughingly and disparagingly, when the memo or e-mail arrives from the executive team about some new program. Last month it was total something and this month it’s holistic something else—always presented with glowing accolades amid the promise of improved morale, better results to present to Wall Street, and a smooth, painless path to execution. Until next month, when yet another bright, shiny program is rolled out. First, ignore it. Like everything else new, this, too, shall pass. Perhaps that’s not an altogether bad reaction. At least no harm is done to the organization. Second, try to implement each and every bright, shiny object that is announced. The result, of course, is chaos. No program has time to gain traction. No focus is allowed. And no value accrues. The net result is that performers turn their scarce attention to areas of performance that are unlikely to produce real value. The bright, shiny object becomes a surrogate, fooling the organization and luring it away from determining what really produces value and then developing measures that encourage the right focus, attention, and ultimately, behavior. Organizations that are run like this spend their time fruitlessly bouncing from the HR initiative to the IT initiative to the sales initiative to no initiative at all. The frenzied pace distracts employees from customers and the core improvements that truly drive the business. And maybe worse, it burns out employees who, despite their best efforts, can’t seem to make sense of it all. Next week we’ll look at what happens when we increase the attention focus but fail to first determine what’s important: the activity focus. What bright, shiny objects are distracting you or your organization? Stephen Covey’s The 7 Habits of Highly Effective People has become a life-altering book for many. 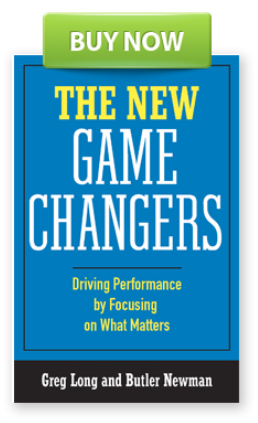 In that book, Covey advises prioritizing one’s time by balancing urgency and importance. He presents a grid with four quadrants. Items in quadrant I are important and urgent (crises, deadline-driven projects); items in II are important but not urgent (planning, relationship building); items in III are not important but urgent (interruptions, meetings, reports); and those in IV are not important and not urgent (busy work, time wasters). Almost everyone agrees that Covey’s principle is sound. But people are often challenged with applying the principle in a practical way. In Covey’s model, the urgency scale pretty much takes care of itself. Phones ringing, clients calling with problems, e-mails arriving from the boss almost by the minute— these are all easy mechanisms that help us define urgency. But what defines importance? That seems to be our biggest challenge. We contend that role-based outcomes provide the answer to that challenge for the workplace. One of the key differentiators between top and average performers is that top performers know what to focus on; they implicitly use a few proven outcomes to determine what is important and what is not. It seems that in today’s world everything is urgent. So urgency itself is not an adequate measure for the workplace. Again we can turn to top performers for a clearer meaning of urgent. A clear differentiator among top performers is that they focus the right amount of time and energy—attention—on what they deem important. 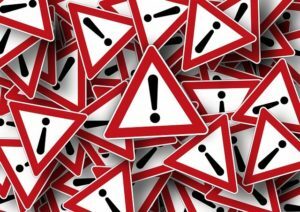 We use the word attention deliberately and will explain our interpretation in more detail next week. We’ll also begin to draw on real scenarios to illustrate the balance between attention and importance and how understanding our role-based outcomes helps achieve the focus required for success today. How do you decide where to focus your attention? And the answer, of course, is “It depends.” Next question. Tom Davenport coined the term attention economy. He rightly argues that people can pay attention to only a certain number of things before they get so distracted they lose focus on the ones that matter. So it is with the major outcomes of a role. An outcome is a big element, a significant part of the role. Accordingly, each outcome deserves a significant percentage of the “attention budget” of a top performer. So, having too many outcomes—typically more than about seven—means the performer’s attention is too divided for him or her to spend enough time and energy on each outcome. On the other hand, having too few outcomes probably means that the role is not fully understood and some additional hidden outcomes exist or that the job is too small and not enough is being asked of the people in the role. That last point is borne out by the research and writing of Daniel Pink on what motivates people to excellence. In short, Pink asserts it is autonomy, mastery, and purpose. His arguments are compelling, and we agree—particularly with his third point: purpose. To give people a purpose, they should be in a role that is weighty enough to matter to them and to their organization. But most commonly, having too few outcomes is an indicator the role isn’t fully understood by those documenting it. To really understand a role through the eyes of the top performers, you have to watch them, talk to them, learn from them, and appreciate their perspective enough that you begin to think like them. Then you can enumerate the outcomes they produce.